Spin Blocks are platforms that are only found in New Super Mario Bros.. When stepped on, the player starts spinning and jumps high into the air, then glide back down slowly. Pressing on the D-Pad while in the air causes the player to perform the Drill Spin, which causes the player to drop more quickly and has the ability to destroy Brick Blocks in a row. 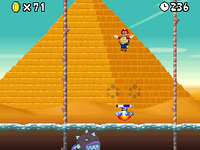 Spin Blocks are also found in the Mario vs. Luigi two-player mode. It only appears on the ice level, where a Big Star eventually appears. There are always coins hovering above the Spin Block. Spindrifts were originally going to appear in New Super Mario Bros., but they were replaced by Spin Blocks in the final build. Sprite from New Super Mario Bros.
↑ New Super Mario Bros. instruction booklet, page 17. ↑ Loe, Casey. New Super Mario Bros. Official Nintendo Player's Guide. Page 32. This page was last edited on November 25, 2018, at 21:09.